Judy Clibborn, chairwoman of the House Transportation Committee, wrote an editorial about ferries in the Seattle Times on Monday. Take a look here and see if you can read between the lines whether the ferries can expect much funding this session. My impression of Clibborn and Mary Margaret Haugen, her counterpart in the Senate, is that they’re resigned to not having any money and we’re just going to have to live with it. And I wouldn’t be surprised if they’re right, but they could at least offer me some kind of false hope. Thanks to Debbi Lester for making me aware of this. A poll taken by PEMCO Insurance found that half of the drivers will find another way around Lake Washington instead of paying a toll for a new Everygreen Point Bridge. That could spell big trouble for traffic congestion elsewhere. The 520 Tolling Implementation Committee, commissioned by Gov. Chris Gregoire last year to evaluate tolling options for financing the bridge-replacement project, will present its findings to the Washington state legislature on Jan. 28. According to PEMCO’s survey of drivers in the Puget Sound region, 51 percent of the respondents said they would avoid the 520 bridge if tolls were put in place. Only 11 percent report they would seek carpool options and even fewer respondents (6 percent) say they would take the bus. PEMCO’s results show that despite drivers’ intentions to use the 520 bridge less often, they are not expressing a willingness to adopt behaviors that will reduce traffic congestion elsewhere. Nearly one-half (47 percent) of respondents say they would use I-90 more often, and one in four (24 percent) would drive north around the lake to avoid 520. When asked what they would do if both the 520 and I-90 bridges are tolled, drivers’ propensity to change behaviors is even lower: only one in 10 would carpool more often, just 4 percent would ride the bus, and 41 percent indicate they would not make any changes to their driving habits. PEMCO’s poll also gauged residents’ willingness to make other changes like move residences, telecommute, or change jobs as a result of bridge tolling. Less than three percent indicate they would pursue any of those options. A Bremerton blogger tells how he overcame a lack of money to catch — barely — the last boat from Seattle. Click here. The Tacoma Narrows Bridge citizens committee recommended in December that tolls stay at $2.75 for Good To Go customers and $4 for cash payers until at least June 30, 2010. Now it’ll be up to the state Transportation Commission to agree or disagree. Word has it that some on the commission are worried that the citizens group isn’t leaving a big enough cushion between bridge revenue and bridge expenditures, and maybe tolls should be raised a quarter or 50 cents beginning on July 1, said Reema Griffith, the commission’s executive director. If real traffic and revenue counts come in close to the projections that the citizens committee used in its calculations, I’d be disappointed if the commission didn’t follow the recommendation. Because of the goofy way the system is set up, though, things could change in the four months between when the committee makes a recommendation and the commission has to decide. Because of Initiative 960, which requires virtually every fee increase to have a legislative vote, the committee must make a recommendation that would take effect on July 1 in the previous December instead of getting four more months of hard data like the commission will have. The tolls are kind of a pay me now or pay me later proposition, anyway. All of them go to pay off or operate the bridge, and unless you move away, you’re going to have to pay eventually. If the tolls are kept at the current rate until July 1, 2010, as the committee proposes, there’ll be a much bigger jump — 40 to 50 percent, Griffith said — than if a quarter or 50 cents were added this coming July 1. Before the toll can be raised, there has to be public meetings, probably in April or May. Traffic was down about 94,000 from November to December, a good bunch of that attributable to the holidays and snow, no doubt. I found it ironic that I got press releases 22 minutes apart this morning, one saying the state was leasing private passenger ferries for when the Hood Canal Bridge closes, the other saying it had completed the sale of its own passenger ferries. I wrote back in November that the state was selling its Chinook and Snohomish to Golden Gate Transportation for $2 million apiece. They finished the deal on Friday. The boats cost $9.7 million and $9.8 million, respectively, when they were built in 1998 and 1999. They’d mostly been sitting around since the Legislature ordered Washington State Ferries to get out of the fast ferry business and sell the boats. They might’ve come in handy in May, however, when the Hood Canal Bridge will close for six weeks. The DOT said today that it will lease boats for two months from Victoria Express of Port Angeles. State crews will operate them. The lease price wasn’t mentioned. The disappearance of a Bellevue woman Jan. 13 after boarding a Seattle-to-Bainbridge ferry remains a mystery, Sgt. Trent Cain of the Washington State Patrol said Wednesday. Detectives continue to follow up leads. “Basically it’s a missing-person case at this point,” Cain said. Lynn Stafford-Yilmaz’s Ford Aerostar van was left on the 10:55 p.m. ferry, and her keys and purse were upstairs on the boat. Security camera film and ferry workers weren’t able to confirm that she was actually on board, however. Stafford-Yilmaz is 5 feet, 5 inches tall and weighs 130 pounds. She has brown hair and brown eyes. Anybody with information is asked to call Washington State Patrol Detective Dave Killeen at (360) 405-6650. Washington State Ferries came out with its long-range draft plans, A and B, that cover the next 22 years, and people should understand them, but it might be easier to address the ferries a biennium or two at a time. For example, the governor has already proposed a ferry budget for 2009-11. We could start with that. She proposes to save $9.2 million by cutting the Anacortes-Sidney, B.C. route. Is that a good idea? Does the route bring in $9.2 million to the Anacortes and state economies every two years? I don’t know, but I think they’ve done this study a few times already and it’d be easy to find out. And you can look at the rider numbers. Maybe the route loses tons of money in the winter and does OK in the summer. You might be able to run just half the year and not lose much and not hurt the community so much. The other thing the guv plans to do right away is put the 34-car Hiyu on the Point Defiance-Tahlequah route instead of the 48-car Rhododendron. It would save $1.3 million. Is that a good idea? The Hiyu is on the route now while the Rhody is in the shop, and I keep getting e-mail alerts from WSF saying the boat is full and to get there an hour early. Maybe you could keep the Rhody until the second Island Home boat is built. The first goes to PT, the next could go to Point Defiance and the Hiyu could be the second boat at PT until the third Island Home is built. If you want to prevent either one of those cuts, money has to be found elsewhere. The following biennium, 2011-13, is when she would cut a boat from each of the Bremerton and Southworth routes. She didn’t say how much would be saved, but it should be pretty easy to find out and you could start looking at how to make up that money elsewhere. That brings us to boat-building. WSF’s Plan A is a pretty good starting point. It would build 3 Island Homes first and then pick right up building 7 144-car boats. A consultant recommended waiting to build the 144s until a lot later. The new boats would replace old ones, not add to the fleet, but some would be a little bigger than the ones they replace. Gregoire’s proposal funds just one Island Home boat that’s already in the process of being built. I’m at home so I don’t have the figures in front of me, but something like $84 million was allocated for Island Home boats and one wound up costing $65 million, so I need to figure out where the other $20 million went. The $84 million came from something like $350 million allocated a long time ago for the 144s. So there’s a couple hundred million left over from that. I don’t know if that got rolled back into the general transportation budget or if it’s still available. Probably not. Another thing is figuring out how to get the boats built for less. People say there’s a big “hassle” factor built into bids for having to deal with WSF. I don’t know if that’s true. I think Rep. Larry Seaquist mentioned an idea to me about having a construction manager handle it for WSF and maybe get rid of some of that extra cost. He thinks we can get the boats a lot cheaper but wants them built in Washington. First you need to check with Todd Shipyards and see if they want the work or are too busy to do it. If they don’t really want it, then you have to go out of state because nobody else here seems to want to bid on ferries. Building them in-state also take you out of the running for any federal subsidies or stimulus money, I confirmed last week. I don’t know what would be available, but you would have to factor that in, too. Rep. Rolfes mentioned Saturday that she’ll introduce a bill to get around that somehow. I’ll find out more about that tomorrow, I hope. Stopped by the Citizens Write Place C ferry meeting Saturday in Bremerton. They had a nice turnout considering it started at 9 in the morning and it took me awhile to even get inside. The stairs outside were blocked off because they were doing some jackhammering there and I couldn’t use the elevator because you need a special pass card. Fortunately, Jan Angel had one and we were able to get in. It was an interesting group. There were the political types — legislators Angel, Seaquist, Kilmer, Finn and Rolfes, city councilmen Runyon, Brockus and Chang, county commish Garrido and the county lobbyist — probably 8 to 10 ferry workers (not admin) and their union people, and the rest were members of the ferry public. There were probably 50-some people in all and they were all packed into a room on the fourth floor because the jackhammers were too noisy to use the council chambers. It was good to see all the ferry/union people there since they know the inside workings of the system. Some good discussions were had and it was a good start all in all. This is kind of a revolutionary approach, in more ways than one. They’re on a tight timeline, wanting to get a plan together by March 2 when Transportation Committees are scheduled to hear ferry bills. They’re ditching the approach that there clearly is no money so cuts have to be made and replacing it with we need our marine highways to work so let’s figure out how to get there. They split into teams that will tackle different topics, such as schedules/service, fleet size/construction, budget, WSF organization and policy, bill drafting and communications. They already have a Web site at www.Citizens WritePlanC.com and we’ll be putting up a forum/wiki on our site this week. Stay posted. 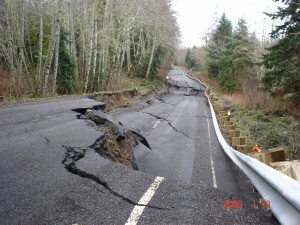 Highway 112 sank up to 8 feet in some places. Department of Transportation photo. This isn’t a big deal to Kitsap. It’s just a good opportunity for me to figure out how to add photos to my blog entries. DOT just sent this release and some pretty good shots, plus Pysht and Joyce cool places and just plain fun to say. massive landslide last week west of Joyce in Clallam County. The dirt under the road keeps moving, so it’s not safe for crews to even get in there and see the extent of the damage. to sink up to eight feet. The 1,000 vehicles that usually travel the highway each day can get around the closure by using highways 101 and 113. More pictures of the slide can be seen here.